ALEXANDRIA, VA - After an extremely successful debut in 2012, the Alexandria Convention & Visitors Association&apos;s (ACVA) corporate community service program Alexandria Cares celebrated the start of year two by gathering meeting planners in a second annual holiday bike building event benefiting underprivileged families. The event, Bows, Baskets & Bikes, saw a doubling in attendees, with a renewed energy after having seen the overwhelming positive impact last year&apos;s donation had on the community. The ACVA sales team, which booked more than $5 million in Alexandria meetings and groups business in fiscal year 2013, created the Alexandria Cares program to meet the increasing demand for service events that provide meaningful team-building experiences, joining a trend in the meetings industry that promotes Corporate Social Responsibility (CSR) initiatives. "Companies are now under strict financial constraints, and can&apos;t just do a ropes course or happy hour as a means of team building," said Melissa Ritchie, ACVA&apos;s team lead for Bows, Baskets & Bikes. "That&apos;s why corporate community service programs are becoming more popular. Community outreach is a way for people to do a team building event that&apos;s in alignment with a company&apos;s vision and goals." In attendance were 16 DC-area event and meeting planners plus seven hotel partners who host events in Alexandria. Attendees were invited to help build bicycles with the assistance of local bike shop experts, Wheel Nuts and Bike n&apos; Roll for underprivileged families through Christ Church&apos;s holiday initiative, the Christ Child Project, which features a Christmas market for low-income families to purchase quality gifts at a fraction of retail value. "This activity allows planners to connect with the community they&apos;re engaging in, in a way they normally wouldn&apos;t have the opportunity to," Ritchie said. 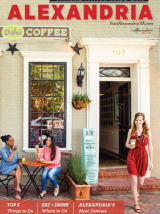 "It allows people to establish an emotional connection with Alexandria, the place they&apos;re conducting business in." In 2012, ACVA created Alexandria Cares in collaboration with Alexandria-based Get Out and Give Back, an organization that pairs businesses with philanthropic opportunities. The program includes a wide variety of service project options, including bowling parties with nonprofit clients, holiday service events and personalized project requests made by the business or service organization. Transportation, food and even commemorative t-shirts can be included as part of the package. The Alexandria Cares program translates into dozens of groups and thousands of volunteers whose work benefits the Alexandria community. Since launching Bows, Baskets & Bikes, Get Out and Give Back has seen an increase in businesses requesting opportunities to participate in community outreach programs, with clients like Coca Cola Refreshments, General Federation of Women&apos;s Clubs and Cultural Vacations and Safaris. While corporations are charged a fee for the service event, the money from events like Bows, Baskets & Bikes returns to the community, with all post-expense proceeds that Get Out and Give Back receives from ACVA-referred corporate service events donated to local charities and causes.